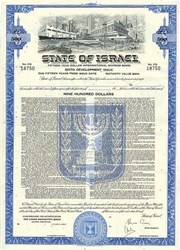 Beautifully engraved RARE Specimen International Savings Bond from the State of Israel printed in 1983. This historic document was printed by Security-Columbian Banknote Company and has an ornate border around it with a vignette of a building, ship, and an airline and an underprint of Israel's Coat of Arms. This item has the printed signatures of Israel's Prime Minister, Shimon Peres and is over 31 years old. Shimon Peres (help�info) (Hebrew ��������� ������ without Niqqud: ����� ���) (born Shimon Perske on August 16, 1923 in Poland, and immigrated with his family to Israel in 1934), is an Israeli politician, who was a supporter of the Labor Party until December 2005, but still holding a status of member. He served as 8th Prime Minister of Israel from 1984-1986 and 1995-1996 and Foreign Affairs Minister of Israel from 2001-2002, and became Vice Premier in a coalition under Ariel Sharon at the start of 2005. In 1994 Peres won the Nobel Peace Prize together with Yitzhak Rabin and Yasser Arafat, for their efforts towards peace which culminated in the Oslo Accords. Peres has never won a national election, despite having won numerous Labor Party primaries. Peres recently left the Labor Party and declared his support of the new Kadima party, led by Ariel Sharon. Early life Shimon Peres was born in Wieniawa, Poland (now Vishniev in Belarus). In 1934, as a child, he moved with his family to Tel Aviv in what is now Israel (then part of the British Mandate of Palestine.) He was educated in the Geula School in Tel Aviv and the agricultural school of Ben Shemen. In 1947, he was conscripted into the Haganah (predecessor of the Israeli Defense Forces) and was appointed by David Ben-Gurion to be responsible for personnel and arms purchases. In 1952, he was appointed Deputy Director General of the Ministry of Defense and in 1953, aged 29, he became the youngest ever Director General of the Ministry of Defense. He was involved in acquiring weapons and strategic alliances for the young state of Israel. Peres' efforts went superbly well with France as he managed to acquire the advanced Dassault Mirage III French jet fighter, the Dimona nuclear reactor and the tri-national agreement with France and the United Kingdom during the 1956 Suez Crisis. Shimon Peres talks to Donald Rumsfeld. Israeli Ambassador to the USA David Ivry (center) joined them in the talks.In 1959, he was elected to the Knesset, as a member of Mapai, the Israeli Labor Party. From 1959-1965 he served as Deputy Defense Minister until he was implicated in the Lavon affair with Moshe Dayan. Peres and Dayan left Mapai with David Ben Gurion to form a new party, Rafi which reconciled with Mapai in 1968 (without Ben Gurion) resulting in the formation of the Labor Alignment. In 1969, Peres was appointed Minister of Absorption and in 1970, he became the Minister of Transportation and Communications. In 1974, after a period as Information Minister, he was appointed Minister of Defense in the Yitzhak Rabin government. He had been Rabin's chief rival for the post of Prime Minister after Golda Meir resigned in the aftermath of the Yom Kippur War. Peres continued to challenge Rabin for the leadership of the party. While again narrowly defeated in 1977 he succeeded Rabin as Prime Minister and party leader after the latter resigned after his wife, Leah Rabin, was found to have maintained bank accounts abroad in violation of then-existing Israeli currency regulations. Subsequently Peres led the Labor Party to its first ever electoral defeat in 1977. After turning back a comeback bid by Rabin in 1980 Peres led his party to another, narrower, loss in 1981. However they won more seats than any other party in 1984 and Peres became Prime Minister at the head of a national unity government composed of Labor, Likud and minor parties. The two parties agreed on an unusual "rotation" arrangement in which Peres would serve as Prime Minister and the Likud leader Yitzhak Shamir would be Foreign Minister. After two years they would trade places. After leaving the Premiership in 1986 he became foreign minister in 1986. In 1988 he led his party to yet another narrow defeat. He agreed to renew the coalition with the Likud, this time conceding the Premiership to Shamir for the entire term. In the National Unity government (1988-1990) Peres served as Vice Premier and Minister of Finance. He and the Labor Party finally left the government in 1990 after making a failed bid to form a narrow government based on a coalition of Labor, small leftist groupings and Haredi parties. From 1990-1992, he led the opposition in the Knesset. In early 1992, Peres was defeated in the first primary elections in the history of the Labor Party, by Yitzhak Rabin, whom he had replaced fifteen years earlier. However, Peres remained active in politics, serving as Rabin's foreign minister from 1992 and briefly succeeding him after his assassination in 1995. During his term as prime minister, Peres promoted the use of the Internet in Israel and created the first Web site for an Israeli prime minister. Peres was narrowly defeated by Benjamin Netanyahu in the first direct elections for Prime Minister in Israel's history in 1996. In 1997 he did not seek re-election as Labor Party leader and was replaced by Ehud Barak. Barak rebuffed Peres's attempt to secure the position of Party President and upon forming a government in 1999 appointed Peres to the minor post of minister for regional development. Peres played little role in the Barak government and was humiliated when in a surprise move, the Knesset rejected his bid for a seven-year term as Israel's President, or ceremonial head of state. However, after the defeat of Barak by Ariel Sharon in the 2001 election, Peres made yet another comeback. He led Labor into a national unity government with Sharon's Likud Party and secured the post of foreign minister. The formal leadership of the party passed to Benjamin Ben-Eliezer and later Haifa Mayor Gen. Amram Mitzna. Peres was much criticized on the left for clinging to his position as foreign minister in a government that was not seen as advancing the peace process, despite his own dovish stance. He left office only when Labor resigned in advance of the 2003 elections. After the party under the leadership of Mitzna suffered crushing defeat Peres again emerged as interim leader. He led the party into coalition with Sharon once more at the end of 2004 when the latter's support of "disengagement" from Gaza presented a diplomatic program Labor could support. As should be evident, Shimon Peres is one of Israel's most durable politicians and is currently the longest-serving member of the Knesset. Shimon Peres with Donald RumsfeldPeres was at one time considered something of a hawk. He was a protege of Ben-Gurion and Dayan and an early supporter of the West Bank settlers during the 1970s. However, after becoming the leader of his party his stance evolved. More recently he has been seen as a dove, and a strong supporter of the notion of peace through economic cooperation. While still opposed, like all mainstream Israeli leaders in the 1970s and early 1980s, to talks with the PLO he distanced himself from settlers and spoke of the need for "territorial compromise" over the West Bank and Gaza. For a time he hoped that King Hussein of Jordan could be Israel's Arab negotiating partner rather than Yasser Arafat. Peres met secretly with Hussein in London in 1987 and reached a framework agreement with him, but this was rejected by Israel's then Prime Minister, Yitzhak Shamir. Shortly afterward the first intifada erupted, and whatever plausibility King Hussein had as a potential Israeli partner in resolving the fate of the West Bank evaporated. Subsequently, Peres gradually moved closer to support for talks with the PLO, although he avoided making an outright commitment to this policy until 1993. Peres was perhaps more closely associated with the Oslo Accords than any other Israeli politician (Rabin included) with the possible exception of his own protege, Yossi Beilin. He has remained an adamant supporter of the Oslo Accords and the Palestinian Authority since their inception despite the First Intifada and the Al-Aqsa Intifada. However, Peres supports Ariel Sharon's military policy of operating the Israeli Defence Forces to thwart suicide bombings. Peres' image is an unusual blend of visionary dreamer and ruthless and opportunistic wheeler-dealer. The former aspect of his image is more widely perceived internationally, while the latter is more commonly seen among Israelis. Often, Peres acts as the informal "spokeman" of Israel (even when he is in the opposition) since he earned high prestige and respect among the international public opinion and diplomatic circles. Peres advocates Israel's security policy (military counter terror operations and the Israeli West Bank barrier) against international criticism and de-legitimation efforts from pro-Palestinian circles. These certificates are normally stamped "Specimen" or they have small holes spelling the word specimen. Most of the time they don't have a serial number, or they have a serial number of 00000 or in this case they used the number 18750. This is an exciting sector of the hobby that has grown in popularity over the past several years.